Description: The second installment in this series reveals breath-taking bravura writing – in the virtuoso piano technique, the dazzling orchestration and the stylistic integration of serialism and good-natured recollection of Viennese tradition. The first three listed above are from 1950 and 1951 but are quite individual, the Fourth unabashedly virtuosic with the flavor of Prokofiev and Bartók in their spiky mode, the double concerto much more lyrical and elegant, in efect a set of variaitons on a slow Viennese waltz, but punctuated by pungent Stravinskian wind sonorities while the two-piano concerto is even more virtuosic than the Fourth and witty as well (is that a quotation from O sole mio providing the thematic glue of the whole piece?). The little, nine-minute piano-and-organ piece, from 1940 is much more intimate and reserved, possibly reflecting a composer new to the USA and trying to accomodate himself to a new country. 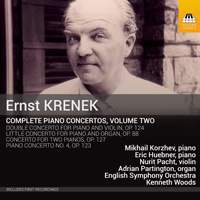 Mikhail Korzhev (piano), Eric Huebner (second piano), Nurit Pacht (violin), Adrian Partington (organ), English Symphony Orchestra; Kenneth Woods.